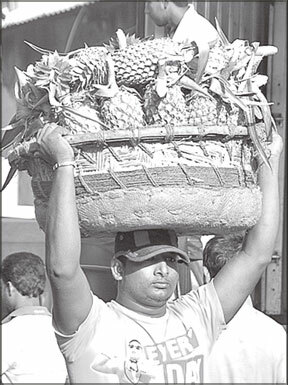 The Ministry of Economic Development has decided to provide pineapple vendors in Belummahara, Gampaha on the Colombo - Kandy Road, with a fully equipped marketing complex. This would replace the existing pineapple stalls scattered throughout Belummahara. At present, the stalls have been located within a distance of two kilometers from the Belummahara junction. Some of the stalls are owned by vendors, while several others have been rented out. The rest are illegal constructions. The new marketing complex to be constructed under Economic Development Minister Basil Rajapaksa's supervision, would prevent the Gampaha pineapple vendors from being adversely affected by the widening of the highway. It would also help to generate a better income, while raising their living standards. The decision to build the complex follows representations made to President Mahinda Rajapaksa, when he visited Belummahara on the way to attend a function at Gampaha. The vendors drew the President's attention to the problems they would face due to the road widening. On his advice, Minister Basil Rajapaksa, held a discussion at Oruthota in Gampaha recently with Deputy Minister Pandu Bandaranayake, Liya Abimana President, Attorney Pushpa Rajapaksa and Gampaha District Secretary J J Ratnasiri. Pineapple vendors too were represented at the discussion. A team comprising of the Divisional Secretary, Grama Niladharis, Pradeshiya Sabha Chairman, people's representatives and pineapple vendors, had been appointed to monitor the building of the marketing complex. Although pineapple, which has its origin in South America was introduced to Sri Lanka via India, centuries ago, the island also had its own native species of pineapple, known as wal (wild) annasi. There are hundreds of varieties of pineapple round the world.. Today, this country boasts of three varieties of the fruit - namely the stout, red striped leaf and the sweet Mauritius (Murusi Annasi), which is the most prolific. At least 90 percent of Sri Lankan pineapples are grown in the coconut lands of Kurunegala, Gampaha, Puttalam and Colombo districts, where pineapple is the most common intercrop. Sri Lanka produces about 35,000 metric tons of pineapple annually and exports the fruit to the USA and the Maldives.